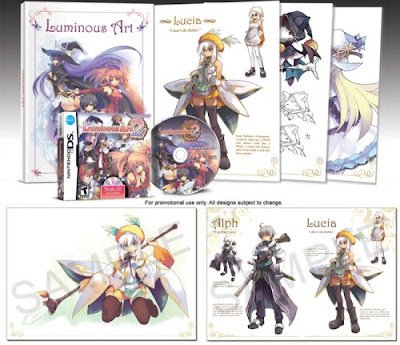 Atlus announced that pre-order purchases of their upcoming Persona 4, Eternal Poison, and Luminous Arc 2 games will receive an artbook and soundtrack CD along with their game when it releases. 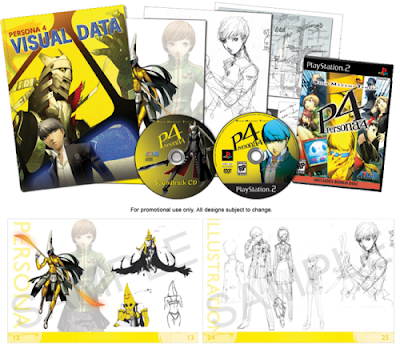 Atlus is basically giving you the ability to buy games that are pre-made to be collectible. Let me go through the factors that make them a game collector's dream. 1. They are published by Atlus. 2. They are RPG's (which keep their value longer and have a better chance of increasing). 4. Two of them are released near the end of the console's lifespan. All of these are factors this blog has analyzed as positively influencing the collectibility of a game. 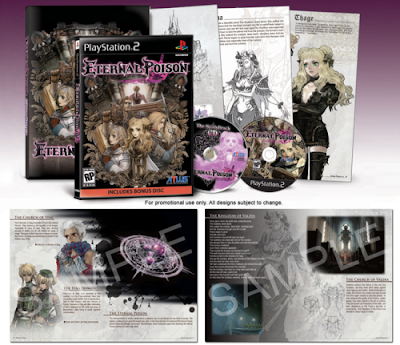 Plus if that is not enough, the artwork is beautiful and the games will most likely be great. Check it out the art below. I'm not saying you should just buy the games and keep them in storage for years, you should play these games at some point too. But it might be a good idea to buy two, one to play and one to keep sealed for your collection. You can pre-order the games at Amazon, Gamestop, EBGames, or GameCrazy and receive this sweet swag. Wow, so many great games being released this holiday season...going to be hard to pick which ones to get now and which ones to wait for; especially since you can't really wait for the price drop on ones like these if you want the bonus collectibles. Noticed Amazon has Guitar Hero: On Tour for DS as it's Deal of the Day (9/23) at $29.99 anyone think its a good buy? The game I guess isn't that great but Guitar Hero name is so popular and I think games with peripherals generally don't drop as much as others so kind of a toss up. I've heard very mixed things about Guitar Hero On Tour. Definitely the cramped finger complaint. But some people have said it is still fun to have GH on the go. Regarding its collectibility, I don't think it will be collectible at all really. It has already sold hundreds of thousands of copies and will continue to sell a lot. It does have a peripheral so it might not drop in value as much as other games, but I wouldn't buy it as an investment. The only gripe I have with your analysis is the inevitability of reprints. Nocturne and Digital Devil Saga both came out with first edition art books, and we've seen the value that they fetched. Now, however, after a few reprints, their value has plummeted. Artbook or not, a reprint of these titles can devastate their expected value. Additionally, Atlus seems to be doing much better for itself and making a much bigger name for itself. As a result, it's making larger initial releases than it ever has. This can also affect things. William - great points about reprintings and Atlus. I agree that reprints of games definitely hurts the value of collectible games, but the limited edition ones still fetch a premium over retail price. I think Atlus in general does sell a lot more units of each game then they used to, which is great for them and the RPG genre, so their future games won't be as collectible as their past games. Are reprints of these games really inevitable? In the case of DS games, how often have any cartridge-based games seen reprints? In the case of PS2 games, what are the chances that you'll see them reprinted once Sony stops supporting the system? the7k - I think you have a good point. I think PS2 games near the end of the life cycle will have a much smaller chance of a reprinting. DS game wise I know it has happened with Trauma Center when it first came out and I heard it recently happened to Tetris DS. The DS cartridges aren't as expensive to produce as those old NES and SNES ones apparently. Nice article. I reserved Devil Summoner 2 based on an early review at RPGfan.com and this article. It sounds like SMT:DS2 might be the last (or one of) the last RPG's released on the system and could become a collector's piece. I've got my fingers crossed at least! Scott - Glad you liked the article. I am going to publish an article today related to this topic. It will be part of a series related to the factors contributing to the value of video games. What causes a game to keep its value and go up in value. I think Devil Summoner 2 fits two or three of the factors. While I have been burned by my thinking in the past, I have to say that I consider almost every Altus title to be collectible upon release. It seems that they never have enough printed at the start, so they only have enough for preorders and a couple on the shelf for opening day. I would like to see Atlus expand how many units they have available on release date, however, I really like the niche that they have carved out for themselves in the gaming space, so I really don't want to see them change a lot either.